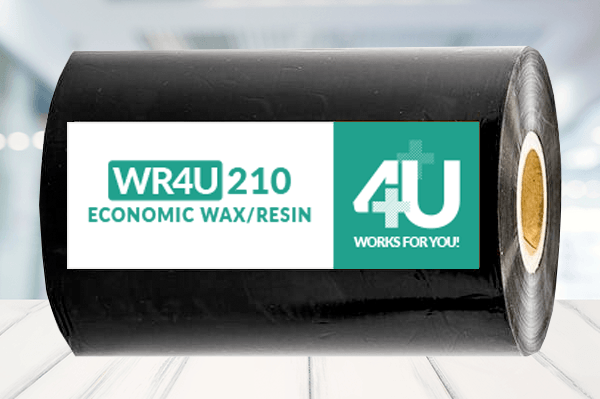 WR4U210 Economic Wax/Resin is a highly resistant and low print energy wax resin quality for you, specially designed for printing labels for wax/resin applications which can be used on all flat-head printers. These thermal transfer ribbons are widely used when you need to print, for example, a smooth material such as plastic labels, tag labels, etc., but also works well when printed on paper and is a highly smudge and scratch resistant thermal transfer ribbon. Excellent print quality, excellent blackness and high definition on all kinds of substrates, including vellum and smooth surfaces. Labels for nursery applications, shipping, retail, but also applications like storage, tags and food contact. Prints from this very economical Wax/Resin thermal transfer ribbons are suitable for many conceivable surfaces, including rough and smooth surfaces. No concessions are made regarding the quality and abrasion resistance of the print.